The longest-common-prefix (LCP) array is an adjunct to the suffix array that allows many string processing problems to be solved in optimal time and space. Its construction is a bottleneck in practice, taking almost as long as suffix array construction. In this paper, we describe algorithms for constructing the permuted LCP (PLCP) array in which the values appear in position order rather than lexicographical order. Using the PLCP array, we can either construct or simulate the LCP array. We obtain a family of algorithms including the fastest known LCP construction algorithm and some extremely space efficient algorithms. We also prove a new combinatorial property of the LCP values. 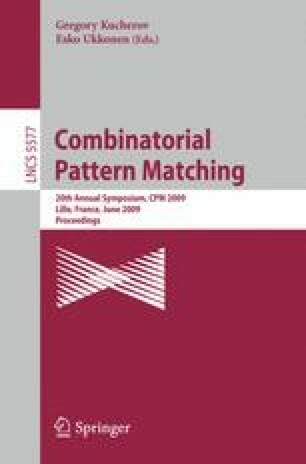 This work is supported by the Academy of Finland grant 118653 (ALGODAN), by the Italy-Israel Project “Pattern Discovery Algorithms in Discrete Structures, with Applications to Bioinformatics”, and by the Australian Research Council.